Rajasthan is home to entrepreneurs and innovative thinkers. Across the State, millions of youngsters full of brilliant ideas, modern thinking and extraordinary skills are ready to join the already buzzing start-up drive. Leveraging this quality of the business-minded individuals of the State, the Government has conceptualised an integrated startup platform called iStart, observes Ahmad Shariq Khan of Elets News Network (ENN). iStart is a one of its kind end-to-end start-up development platform to foster innovation, create jobs and facilitate investment. The programme aims to nurture entrepreneurship and it not only provides an impressive platform for investors but also has created a competitive environment amongst the youngsters working in the start-up domain. iStart, in addition to acting as a one-stop solution for start-ups, incubators, and Venture Capitals (VCs) for ease of doing business, helps start-ups connect with investors, accelerators, and incubators, thereby assisting in building an environment where there would be an easy access to knowledge-exchange and funding. It’s worth mentioning here that there is a provision of Rs 500 crores by the State Government for matching funds to start-ups, including a separate provision for women and Green IT start-ups. 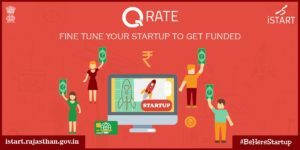 Sub Initiatives under Rajasthan Start-up Ecosystem QRate: Qrate is the only start-up rating mechanism in the country, accepted by all leading VCs and investors. It is an assessment programme which provides a detailed report on the start-ups potential and investment worthiness. Much like a health check-up report from a diagnostic lab, QRate scorecard and assessment report provide start-up founders actionable insights to help them strengthen their business plan and improve their chances of getting funded. Under this programme, boot-camps are organised to help start-up owners refine their product, strategy, and business plans. Currently, all start-ups in Rajasthan are Q-Rated. 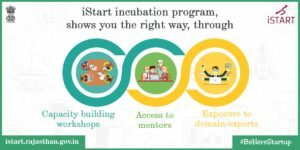 iStart Nest: With iStart Nest, the Government of Rajasthan’s incubation centres could be called the only incubators in the country providing free incubation to emerging start-ups. iStart Nest is designed to help start-ups gain traction through deep mentor engagement, rapid iteration cycles, and fundraising preparation. iStart Nest offers state-of-the-art facilities at its incubation centre with a wide range of resources and mentoring from industry tycoons. iStart Nest works with an extensive network of investors, accelerators and mentors to help entrepreneurs launch and grow the innovative companies that are building Rajasthan’s future. Challenge For Change: Challenge for Change is an initiative wherein organisations are provided with an opportunity to partner with the Government of Rajasthan and play an important role in empowering Rajasthan to be the Digital-sthan of the country. The major objective of this initiative is to invite IT solutions for various citizencentric services by the government and recognise and promote the potential of the young brains. The youth, working professionals and start-ups can share their innovative idea or provide an original solution for any existing challenges floated by the Government and thus, help bring ‘change’ that would ultimately benefit the masses. It is like a dream come true for young entrepreneurs to have a direct order of up to Rs 1 crore. In this one of a kind initiative, the young entrepreneurs can directly work with the government without following the traditional tendering process. Rajasthan Stack: It is a one-stop destination for all the e-governance and technological requirements for residents of the State, as well as for budding entrepreneurs. Rajasthan Stack is essentially an integrated platform which offers multiple services to sort out the technology requirements of start-ups. Each service, resource, application, and infrastructure offered by the Government of Rajasthan can be accessed for free. The idea is to encourage start-ups and provide them ease of doing business, thereby paving the path for a concrete start-up infrastructure in the state. Bhamashah Techno Hub: Bhamashah Techno Hub is going to be country’s largest incubation centre which will house more than 700 emerging start-ups of the State. This world-class incubation centre will be a one-stop solution for all the entrepreneurs to get amenities like free space, connectivity, easier funding, mentorship, exposure and much more. The incubation centre does not charge any kind of fee from start-ups as well as entrepreneurs and provides free facilities unlike other incubation centres of different cities. It will be the biggest incubation centre as compared to existing operational hubs of India. Bhamashah Techno Hub will provide an entire support system to emerging entrepreneurs. From assisting them to pitch their ideas, to providing mentorship and also connecting them to potential investors and VCs, it will act as a launching pad for innovators. This 1,50,000 sq ft of incubation space will be entirely dedicated to entrepreneurs and their development with the world-class facilities such as co-working space, connectivity, easy funding, mentoring and advisory support all under one roof. Bhamashah Techno Fund: Bhamashah Techno Fund of Rs 500 Crores for start-ups has been introduced to give an open sky to the potential start-ups of the State. The fund would be used for start-ups of the State for their growth and all-round development and to levitate the start-up community of Rajasthan to the pinnacle in the country. Out of the Rs 500 crore, Rs 100 crore is dedicated towards women entrepreneurs and Rs 50 crore for Green Startups. The launch of Bhamashah Techno Fund has motivated the start-up enthusiast of the State to initiate their own ventures with the support of government. Bhamashah Techno Fund has been disbursed to eight start-ups within 10 days of its launch and in May 2018, 15 more start-ups have been funded. Student Start-up Exposure Programme: Student Startup Exposure Programme was implemented to create a strong entrepreneurship pipeline among the youth of the State. Through the exposure programme, the Rajasthan government sends 100 selected students from the State to an all-expense paid residential learning programme in Silicon Valley. The programme is open to any student pursuing higher education in any college of the State. The top 100 selected students from the State are hosted by Menlo College in Menlo Park, Silicon Valley. Over the course of two weeks, they learn various aspects of building a tech product start-up from renowned experts in the global start-up ecosystem. The participants receive mentorship to build their prototype and pitch it to prospective investors in the Silicon Valley and gain feedback from them. During the tenure of the two-week programme, students also get a chance to acquire on-the-job training at some eminent organisations and interact with successful founders and other key professionals. Certainly, with the launch of all these initiatives, the Government of Rajasthan looks to be fast developing its digital infrastructure and promote entrepreneurship in the State.